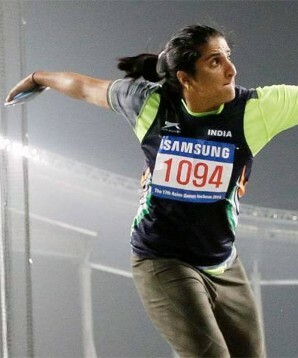 Seema Punia is an Indian discus thrower who is best defined for her victory at the Pat Young's Throwers Classic 2016 at the Salinas (California) in the United States. The best throw in her career is 62.62 meters, which is 205.4 feet. She hails from a small village Khewda in the Sonepat district of Haryana and has come a long way carving her niche in an area, which is not often a dream of small-time girls in India. She earned the nickname of Millennium Child in the same sporting event. Seema was barely 11 years when she started into the world of athletics trying her luck as a long –jumper and hurdler and later shifted to discus throw. Since then she has come a long way winning a few medals at prestigious places. Since then it was no looking back for her. She came in the limelight when she beat Neelam J Singh at the National n Calcutta with 57.30m. It was in 2000 when this young lady won the gold medal at the World Junior Championships; however, she was unfortunate to lose it as she failed to pass the test for pseudoephedrine. It was an offence at that time by the National Federation; hence her medal was stripped off. It took just two years to see the comeback of this talented athlete when she bagged the bronze medal for the country in the World Junior Championship held in 2002. She then went on to win a silver medal in the 2006 Commonwealth Games, which even led the state government (Haryana) to honour her with the prestigious Bhim Award the very same year. However, her absence in the Asian Games held the same year made headlines in the media. She opted out voluntarily since was tested positive for the steroids before the Games but was later cleared. 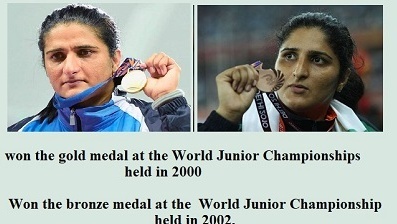 Maybe she did not want to take the chance that led her out in the Junior World Championship earlier in 2000. Back in 2010, she bagged once again the bronze medal in the 2010 Commonwealth Games, while at the London Olympics held in the year 2012, she was not lucky enough to bag any medal as was placed on the 13th position. In 2014, the silver medal was her destiny in the Commonwealth Games but was lucky in Asian Games to the Gold. While in the recently held Asian Games (2018), she bagged the silver medal. We may find India among the emerging economies, yet rural India remains in the garb of traditional taboos where young women are still restricted in the kitchen and the usual household chores. But thanks to the sports icon like Seema Antil, the country is getting great potential from the rural heartland. 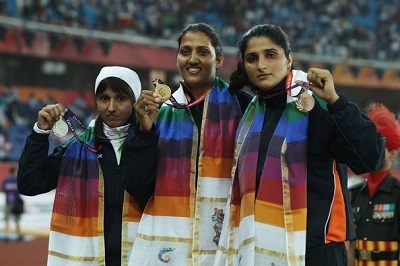 She is now named as Seema Punia when she got married to Ankush Purnia who was her coach and has even represented the country for the Olympics in Athens in 2004. It was not difficult for her to enter into the field of sports as she has a strong sports background. Both are brothers are into different sports, with the elder one – Anandpal Singh is a known wrestler while the younger one – Amitpal is a hockey player. She can be defined as rangy and tall who has miles to go as. Joginder Singh Saini the former national coach has some good plans for the lady. He is the man who is in-charge of running the Junior Programs for athletes in India is planning to send Seema to Europe for her advanced training. This will give an edge to her skill sets. He is now looking for some training facilities in Germany so that the lady gets her advanced training to break more records in the coming years. Seema now 34 is hoping to book her birth at the Olympics 2020. This is just the start for the lady she has to cover more such milestones to embark upon a global icon in her chosen sport of discus throw.